Full Detailed Reports using either PACP or WRc syntax. Summary Reports: Major Defect Summary, Inspection Success Summary etc. Access/Excel databases (both PACP and bespoke). Sewer.dat, Sewer1.dat and many other formats available, including bespoke. Video on CD\DVD – MPEG1 /2/4. MPEG 1 is the recommended format. Free issue Amtec Media Player that has a number of useful features aimed at this industry. 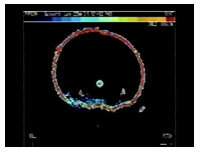 Sonar Images, High Resolution, with free issue viewing software. Photos, hard copy, JPEGs etc. 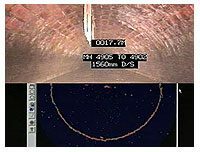 An Amtec Inspection delivers a comprehensive report including a straightforward management summary of all major defects and features as well as full detail logs, videos, sonar, photos. 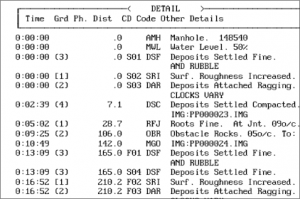 On the right is a small extract from a survey log-file. A comprehensive list of references can be supplied on request. You may have had a disappointing experience of pipeline surveys in the past. 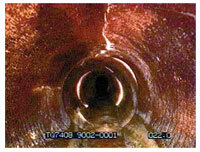 All we ask is the opportunity to demonstrate to you that our Inspection methods deliver the information you need in order to maintain your sewers effectively and without unnecessary expense. We have completed many hundreds of successful projects both in the USA and internationally. Not only do we have many references from past customers but more importantly, those customers return to us when they have further projects. They recommend us to colleagues with similar needs.